God, it feels good when he does that! From the first time we met, there’s been this way that he has been able to just push his head up in under my jaw, rubbing up under my ear—back and forth—that just overwhelms me. It rubs my fur that little bit the wrong way, you know? Then, if he follows up with a smooth arc up to my ear and starts licking the edge of it—I’m just helpless! The tingles ripple the whole way up and down my spine until I have a ridge of hair standing up all the way from my mane to my tail. Of course, it doesn’t really matter which form I’m in—even as a human it feels much the same. I’m glad we were cats when we met though; people look at you a little funny if you go up to them the first time you meet and start sniffing and rubbing your face along theirs. I can’t imagine if I had met him in some office environment, shaking hands, being polite, unable to smell whether he was aroused by me at all. It amazes me some days that humans ever manage to mate. They work so very hard to separate themselves from one another! It’s sad, really. When I met Gazi, the scent was like magic! 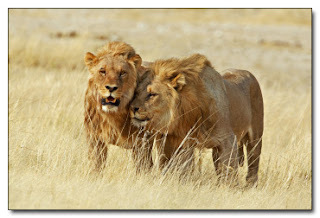 We’d both been out on the savannah for some time, young, evicted from our birth prides. It’s a lonely, hungry time as a young male, and it was unlikely to get much better for me, as I had no interest in undergoing the efforts to build my own pride. I hadn’t made an alliance with another young male yet, but I needed to—it’s too hard to bring down food as a lone hunter out here. The leopards manage, but they’re loners to start with. I’m not. I need the love and attention of another to feel complete. Gazi does that for me. God, he’s strong. He doesn’t fear anything, yet he will come in under my jaw as if I somehow warrant his obeisance. That first morning, I had just taken down an injured impala, when I detected a slight movement in the tall grass. Still downwind of me, there was Gazi, moving in from my right. He was stunning! His fur rippled and shone in the early light; his mane blew up in an undulating crest that caught the first rays of the sunlight as dawn crept over the far rise; and the scent! The scent of him was all about attraction. Even though he was also hungry, and the smell of the blood from my kill must have been driving him mad, his eyes were on me, his musk strong with desire. I stood there in shock and wonder as he came up against me, rubbing and sniffing as if he belonged in my space. I can still feel the short hairs on his forehead brushing up under my chin, tickling and enticing, as he made his way up along the sweep of my jaw, until he started to groom me, licking the edge of my face, and finally my ear. I had never wanted something so badly in my life! I had heard my parents discussing males who would stay in their youth partnerships for love of one another, never forming a pride, but I wasn’t sure I was willing to believe it. Now, here was the most beautiful, affectionate creature I had ever encountered, and he wanted me! The second surprise carried in his scent was that he was another shifter. There aren’t that many shifters that still follow the traditional life patterns like our pride. Most of the young males, for example, take human form and go into the cities for the years after eviction from the pride. I was astounded to find Gazi out here in the wild with me, following the ancient patterns. I had assumed that I would need to partner with a pure lion for hunting purposes—we do sometimes—but Gazi’s presence changed all that in an instant. It’s been two years now since he joined me that morning. We’ve been inseparable: paired as mates, successful as hunters, we are the best of friends and partners in both our forms. Occasionally, we visit one of our families, usually in human form. It’s still hard for the fathers to respond non-aggressively to adult males in cat form, even though nobody still thinks we are a threat to the females of either pride. Right now, though, Gazi is doing that thing under my chin, and I need to go spend some time with my mate! Jean is a reader here on the blog, who found one of the Thursday prompt pics tickling the muse and the hair under a lion shifter's chin. With this much imagination, we can hope for more fiction from her pen! Thank you for such a lovely little story that left me with a smile.